The tornadoes began in Texas. Just after the White Deer tornado dissipated, the first tornado of this event formed five miles (8 km) northwest of Pampa, Texas. The series of tornadoes would cut a path of destruction through three states, ending near St. Leo, Kansas. In Texas, the funnel passed northwest of Canadian. When it struck the tiny town of Glazier, it may have been as much as two miles (3 km) wide. Press reports told of two people who were known to be together in Glazier before the tornado struck were found three miles (5 km) apart afterward. Glazier was considered completely destroyed, with 17 dead, a major percentage of the populace. Much of Higgins, Texas, on the Texas-Oklahoma border, was also destroyed—the accepted death toll here was 51; again, a major fraction of the residents of the town were killed or injured. 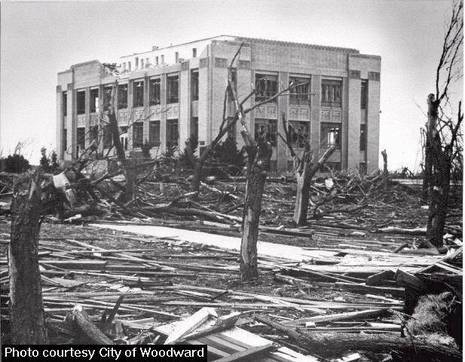 The most deadly tornado to ever strike within the borders of the state of Oklahoma occurred on Wednesday, April 9, 1947 in the city of Woodward. 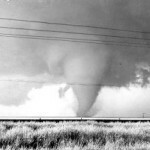 The Woodward tornadic storm began in the Texas Panhandle during the afternoon of April 9, 1947, and produced at least six tornadoes along a 220 mile path that stretched from White Deer, TX (northeast of Amarillo) to St. Leo, KS (west of Wichita). The tornado that would strike Woodward began near Canadian, TX. Moving northeast, it continued on the ground continuously for about 100 miles, ending in Woods County, Oklahoma, west of Alva. The tornado was massive, up to 1.8 miles wide, and traveled at forward speeds of about 50 miles per hour. It first struck Glazier and Higgins in the Texas Panhandle, devastating both towns and producing at least 69 fatalities in Texas before crossing into Oklahoma. In Ellis County, Oklahoma, the tornado did not strike any towns, passing to the southeast of Shattuck, Gage, and Fargo. Even though no towns were struck, nearly 60 farms and ranches were destroyed and 8 people were killed with 42 more injured. Moving into Woodward County, one death was reported near Tangier. What is now considered as clearly a family of tornadoes moved northeast and north-northeast from northwest of Pampa to near St. Leo, Kansas. After the White Deer Tornado turned to the north and dissipated, this event formed 5 miles northwest of Pampa and cut a historic path of destruction across three states. The funnel passed northwest of Canadian. Along much of its path in Texas and Oklahoma, it was reported to have been from one to two miles wide. 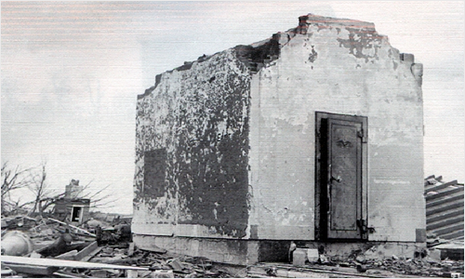 The entire town of Glazier, and much of Higgins were destroyed. The generally accepted death totals are 17 at Glazier and 51 at Higgins. Injury totals were 40 and 232, respectively. According to dubious national press reports, two people reportedly together at Glazier were found three miles apart. The property damage in Texas was $1,500,000. Passing into Ellis County, Oklahoma, the tornado killed six more people as it passed near Shattuck, Arnett, Gage and Fargo, destroying dozens of farms and ranches. Ellis County losses were put at $1,264,000. At Woodward, the tornado killed at least 107 people, mostly in the northern half of town, where about 1,000 people were injured, over 100 city blocks were devastated, and over 1000 homes were damaged or destroyed.